All of our ‘different’ religions are actually, and simply, different interpretations, that include purposeful misinterpretations, of PRECISELY THE SAME THING. All of them. Everywhere. No matter what we look like or how we practice it. They are our ‘alternate same beliefs’. A baby arrives in its purest most divine state. Anything different is ‘false advertising’ only, for control purposes, ease of rule, and to evoke a sense of unity and belief that ‘what really matters is being taken care of’, that I go into in other writings. You see, I always knew inside that if a baby grew into a child, who grew into an adult, who never had any contact with humans to tell him or her what to believe, then that human was by no way bad or ‘evil’. Quite the contrary in fact. Our Source – or whatever your word – speaks to us, in the form of thoughts given us, when we have a space for them. This instruction is higher and more pure a GUIDANCE and more personally appropriate for that individual, than ANYTHING from another human’s work. All written works, bibles – whatever your word – are all interpreted and written by humans, reinterpreted for distribution to the taste and flavor of another human, translated, reinterpreted etc. They all contain truth. They all contain stuff that really needs an overhaul as it is just confusing everyone. There is no need for us to be continuing to use shaky or floppy words of many centuries ago, or doing actions that are irrelevant to us now in this time, now we know better. There are definitive rules to life as a Human Being on earth. It is for US, to choose all the best things, from each of our books/religions. To use our knowings, our love and our commitment for the best we can be. It is wonderful we have it all in writing so we can sort through it, and pick the most suitable things, change others, and add updated knowings. We can easily use our human special skill ‘solution-seeking creativity’ to do this and I am keen to continue reading what I love from each of them, as certain celebrations and traditions in some of them, strengthen us and maintain us in health in better ways, and more reliable ways, than others. 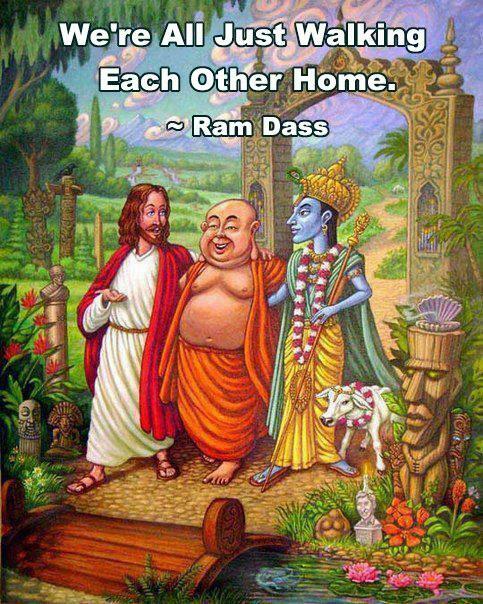 The point of all our religions is to be the embodiment of them. To BE love, and how can we be love and want to take from another or harm another at the same time? This is proof it is not correctly interpreted, that it is illogical, and being used for the intent for something on this plane/earth. I give credit and thanks though that we have up until this point fiercely protected our individuality from the take over by others without our best interest. I give credit and thanks to all those who have followed their own inner knowings in maintaining cultural strengths, as without it, we could all be speaking English now, and our world’s state of health would be in a much worse state!!!! There is such a thing as the Akashic Records as I like to call ‘The Records Of All Consciousness’. To obtain ‘access’ requires a committed discipline and uncompromising way of living in truth, love and integrity. There are those of us who have reached this ability within each religion, as religions are only as strong as the individuals within them, but it is they who have done this, IT HAS NOTHING TO DO with the particular faith or religion followed, led or represented. They as individuals have chosen this path, and got it right! All our religions have these human beings within them. This does not make one religion better than another, it is simply the ‘container’ for them to be in, and they strengthen and hold the energy in return. I do not follow any religion as I do not find them, as they are, adequate enough to do so. They ALL – without exception – can be improved upon so that they really guide us and represent us! I do my own spiritual practice and follow a way that I worked out gives me my best life possible while assisting earth with hers. I consider I am a spirit being in human form, I live in respect of all life, and I consider myself and my home to be sacred space. Life guidance should not be selective or secretive or tricky or full of confusing rules! Ridiculous! I feel even this in some way stems to the strategy of ‘removal of confidence’ , and there fore the need to make a big song & dance about what you do, to fulfill that need within you of achievement and respect, or as ego fulfillment, that a human should be able to feel aside from any job/career choice. Life guidance should be easy, loving, supportive and respectful! Anything else is vibrationally low. We Human Beings ARE ENERGY beings. Divine wish and love requires we have a high vibration. Anything harmful, hate filled, or fear filled IS NOT divine wish at all. Inside you already know that. WE all have the same angels, where we have ourselves in a muddle is with our old books, our interpretation of our old books, as the old histories do not apply. We are wiser now, we are needing to know more, and we are suffering the consequences of keeping ourselves stuck. We are not letting our energy flow and doing what comes naturally to us. To Be Human is to create, and the only reason we have the situations we do, is because we have not created another one!